Speccy lets you explore all information about operating system, RAM, CPU, motherboard, graphics, optical drives, storage devices, network, audio, peripheral and more. Classic days, directX and other 3rd party applications were used to see what’s happening in computer hardware. it is useful to find device vender, model and more information that can help user to find matching drivers easily. 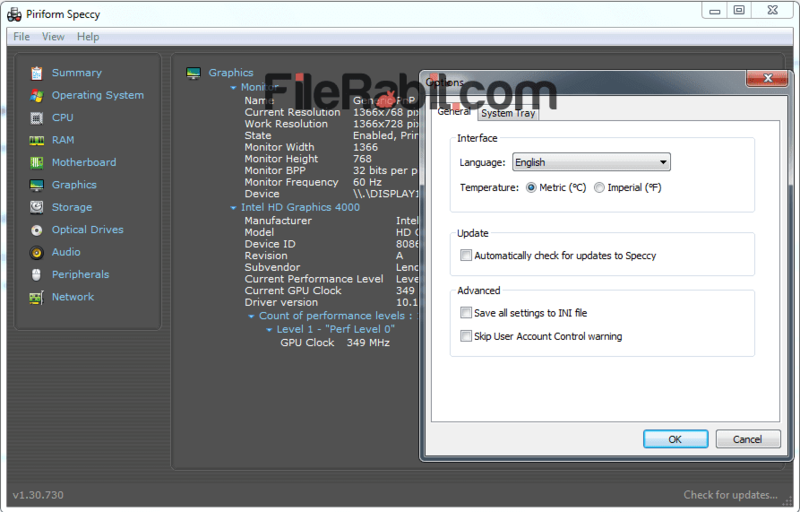 It is also another freeware product released by Piriform that already serving users with a lot of apps. Take a quick and deep view of different parts of system hardware before purchasing a machine. The main page shows a detailed summary of all above mentioned specified hardware parts. Finding complete details of any hardware is difficult job because Windows Device Manager shows unknown device before installation of drivers. 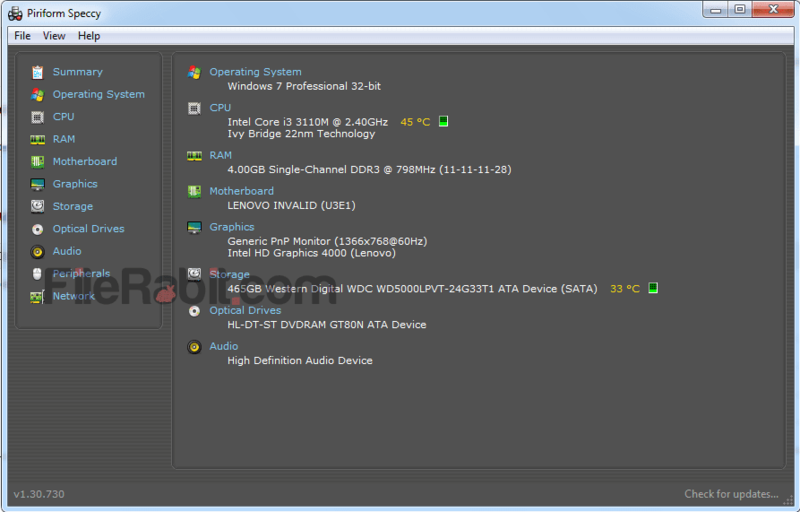 There are many third party CPU hardware stats monitoring tools but Speccy is one of free and responsive one. 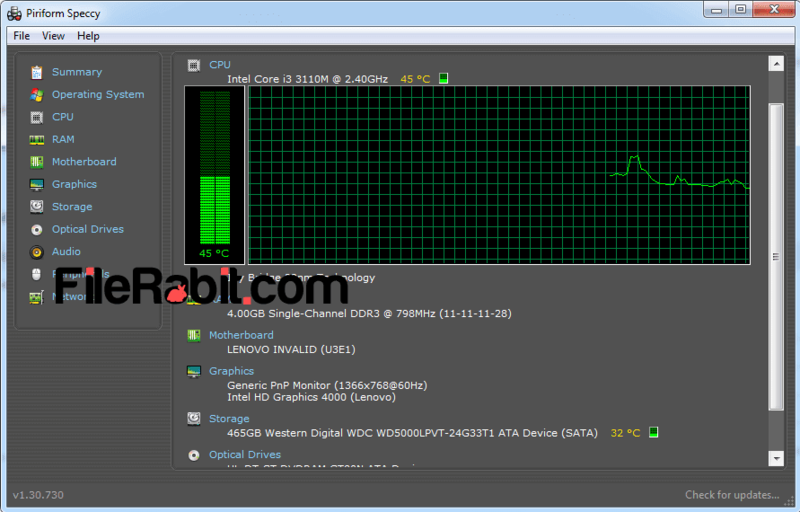 Real time monitoring of GPU and CPU temperatures in centigrade or Fahrenheit alongwith green bar live stats. This will keep you updated with live system heat and temperature problems. Run Speccy before purchasing a desktop, notebook or laptop computer to know exact specifications of target machine. There is a portable version of Speccy that doesn’t need any installation which can be from memory card, USB drive or removable media. Furthermore, find companies, models and further details of sound, graphics, network adapter, motherboard and peripheral devices. Click on Run from start menu, type “dxdiag” and hit enter to start this tool immediately. This is default utility to get detailed information about system hardware. It will list only basic details but if you need advanced than you have to run Speccy.